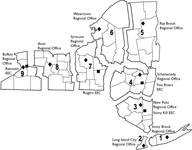 In response to a number of written requests, the New York State Department of Environmental Conservation (NYSDEC) is hereby announcing the extension of the public review and written comment period for the Air State Facility permit No. 9-2934-00022/00233 modification application submitted by CWM Chemical Services, L.L.C (CWM) for its facility located at 1550 Balmer Road in Model City, NY. This comment period is being extended to allow the public more time to review this modification application and the Draft Permit prepared by the NYSDEC. The written comment period which was originally to expire on September 22, 2017, is being extended an additional 30 days, and will now extend through October 23, 2017. The meetings will feature a 30-minute presentation by DEC Fisheries staff describing current management practices for trout streams and will include key findings of a statewide study completed in 2015. The purpose of this workshop is to describe and demonstrate current structural pruning strategies to improve architecture on young, medium-aged, and older trees. Dr. Edward F. Gilman will conduct the workshop. ISA and CNLP credits pending. Early registration is due by October 13th. Notice of the public hearing and public comment period for the Draft Mute Swan Management Plan was originally published in the ENB on September 13, 2017. Information on the Draft Mute Swan Management Plan, the availability of documents, the public comment hearing process, and how to submit public comments to the Department is contained in the September 13, 2017 notice. The New York State Department of Environmental Conservation (NYSDEC) has scheduled public hearings on the Mute Swan Revised plan. Date, time and location of the last public hearing are listed below. This hearing will give the public an opportunity to provide feedback on the revised plan. The public is encouraged to provide written comments on the revised management plan in writing to the contact listed above. The public comment period will close on December 13, 2017. DEC is holding a public meeting on trout stream management in Oneida County at the Utica State Office Building to provide an overview of the state’s approach to trout stream management and elicit feedback from anglers regarding their preferences and expectations for the management of trout stream waters. Doors open at 6:30 p.m. and the presentation begins at 7:00 p.m.
DEC has received a Brownfield Cleanup Program (BCP) application for a site known as Ex-Eaton Site, site ID #C819022. This site is located in the City of Batavia, within the County of Genesee, at 22-40 Clinton Street, Batavia NY 14020. Comments about the application must be submitted no later than October 27, 2017. The application, draft work plan and other relevant documents can be reviewed at: Richmond Memorial Library, 19 Ross Street, Batavia NY 14020. DEC has received a Brownfield Cleanup Program (BCP) application and Draft Remedial Investigation Work Plan for a site known as The Peninsula, site ID #C203097. This site is located in the City of New York, within the County of Bronx, at 1221 Spofford Avenue, Bronx NY, 10474. Comments about the application and draft work plan must be submitted no later than October 27, 2017. The application, draft work plan and other relevant documents can be reviewed at: New York Public Library – Woodstock, 761 East 160th Street, Bronx, NY 10456. 155 Food Center Drive, site ID #C203098. This site is located in the City of New York, within the County of Bronx, and is located at 155 Food Center Drive, Bronx NY 10474. 355 Food Center Drive, site ID #C203099. This site is located in the City of New York, within the County of Bronx, and is located at 355 Food Center Drive, Bronx NY 10474. Comments about the applications must be submitted no later than October 27, 2017. Copies of the applications and other relevant documents are available at: New York Public Library – Woodstock Branch, 761 East 160th Street, Bronx NY 10456 --and-- Bronx Community Board #2, 1029 East 163rd Street, Bronx NY 10489. New York State Department of Environmental Conservation (NYS DEC) is proposing to amend both the Five Mile Conservation Easement (CE) Interim Recreation Management Plan (IRMP) and the Kildare Conservation Easement RMP portion of the Raquette Boreal Wild Forest Unit Management Plan (UMP) to construct the 1.25 mile "Kildare Connector Road" between the Five Mile and the Kildare CE lands. Comments are welcome and will be accepted by the contact person listed above until October 27, 2017. The Draft Amendment is posted on the DEC website at: http://www.dec.ny.gov/lands/22573.html. DEC is proposing to amend both the 5 Mile Conservation Easement (CE) Interim Recreation Management Plan (IRMP) and the CE portion of the Raquette Boreal Wild Forest Unit Management Plan (UMP) to construct a connector road between the Five Mile and the Kildare CEs in the town of Hopkinton, St. Lawrence County. The road will provide access to many miles of motor vehicle roads on the Kildare CE. It will also provide non-motorized recreational access to the adjacent Raquette River Wild Forest and Raquette-Jordan Boreal Primitive Area. The draft amendment plan can be found on the DEC website. Public comment on the draft amendment plan will be taken for 45 days beginning September 12, 2017 and ending October 27, 2017. The public can submit comments via email or in writing to Peter D’Luhosch, Conservation Easement Specialist, NYS DEC 6739 US Hwy. 11, Potsdam, NY 13676 or by calling 315-265-3090. DEC is proposing to amend both the Five Mile CE Interim Recreation Management Plan (IRMP) and the Kildare Recreation Management Plan portion of the 2006 Raquette Boreal Wild Forest UMP to construct the "Kildare Connector Road" between the Five Mile and the Kildare CEs in the town of Hopkinton, St. Lawrence County. The draft amendment plan can be downloaded from the link below. The Department will accept public comment on the draft amendment through October 27, 2017. DEC invites the public to comment about a proposal to address contamination related to the Former Damshire Cleaners Site (Albany, Albany Co.), within New York's State Superfund Program. Public comments about the proposal will be accepted through October 27, 2017. A public meeting also will be held: Tuesday, October 17 at 6:00PM at the Crossings of Colonie, 580 Shaker Road, Loudonville, NY. Project documents can be reviewed at: William K. Sanford Town Library, 629 Albany-Shaker Road, Loudonville, NY 12211; phone: 518-458-9274.